Have you ever wished that you could hug your chosen "book boyfriend" or "book girlfriend"? Well now you can! 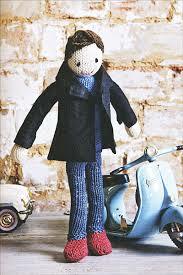 By ordering this listing you can have me hand knit a boyfriend/girlfriend doll for you! Simply describe in the note part of your order who your book boyfriend or girlfriend is, and what you want your doll to look like. Remember to include what clothes you want him or her to wear as well as their hair and skin color!